Butler forward Tate Mohney was named to the all-state team for boys soccer after scoring 18 goals for the Golden Tornado. Seneca Valley's Louis Newell, who scored 10 goals, was also named to the team. For Louis Newell, it was a great way to cap his soccer career. For Tate Mohney, it serves as a springboard toward what figures to be a decorated senior campaign. A senior midfielder at Seneca Valley and junior forward at Butler, respectively, both players were recently named to the all-state team. Newell began wrestling in kindergarten and picked up soccer in the second grade. The former has been his best sport. He already has a WPIAL title and a pair of runner-up efforts at states to his credit. Mohney led an impressive turnaround for Butler. In 2016, the Golden Tornado won just a single section game. This fall, the team won six such contests, won a playoff game and finished with a final record of 14-6. Mohney paced Butler in goals with 18. Troy Mohney, Butler's coach and Tate's father, saw marked improvement in his son's game this year. As big of a threat as he is to score, Tate Mohney has proved to be as good of a distributor of the ball. 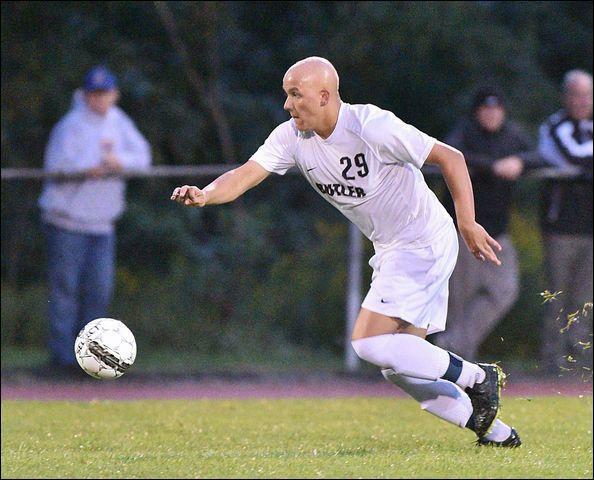 In his three varsity seasons, he has scored 29 goals and contributed 30 assists. His 18 assists this fall fell one short of the program's single-season record. His all-state selection tells Tate Mohney he is right on schedule in his soccer career. “It's a great honor,” he said. “It was one of my goals before the season and I want to get All-American next year.